Catalan nationalism is the ideology asserting that the Catalans are a nation. The scope of their national objectives diverges. While some restrict them to Catalonia-proper alone, others seek the acknowledgment of the political personality of the so-called Catalan Countries, the Catalan-speaking territories as a whole. Such claims, which can be seen as a form of Pan-nationalism, can be read in official documents of CiU, ERC  and Popular Unity Candidates (CUP). Besides Catalonia, the main Catalan-speaking regions have their own nationalist parties and coalitions which support, to varying degrees, the demands for the building of a national identity for the Catalan Countries: Valencian Nationalist Bloc (BNV) in the Valencian Community, Bloc Nacional i d'Esquerres, PSM and Majorcan Union (UM) in the Balearic Islands. Other nationalist parties have existed with additional affiliations such as PSC - Reagrupament whose leader Josep Pallach i Carolà died in 1977. During the first centuries of the Reconquista, the Franks drove the Muslims south of the Pyrenees. 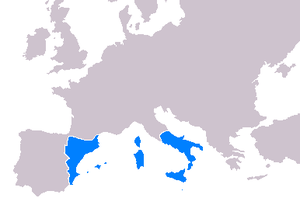 To prevent future incursions, Charlemagne created the Marca Hispanica in 790 CE, which consisted of a series of petty kingdoms serving as buffer states between the Frankish kingdom and Al-Andalus. The Renaixença ("rebirth" or "renaissance") was a cultural, historical and literary movement that pursued, in the wake of European Romanticism, the recovery of the Catalans' own language and literature after a century of repression and radical political and economical changes. As time went by, and particularly immediately after the fiasco of the Revolution of 1868 (led by the Catalan general Juan Prim) and the subsequent fail of the First Spanish Republic (1873–1874), which many Catalans expected an instauration of a federal republic, the movement acquired a clear political character, directed to the attainment of self-government for Catalonia within the framework of the Spanish liberal state. The concept of Volk entered Catalan intellectual circles in the 1830s, stemming from the emphasis on the region's medieval history and philology. It first appeared in the writings of Juan Cortada (1805–1868), Marti d'Eixalà (1807–1857) and his discipline, Francesco Javier Llorens y Barba, intellectuals who reinvigorated the literature on the Catalan national character. Inspired by the ideas of Herder, Savigny and the entire Scottish School of Common Sense, they asked why the Catalans were different from other Spaniards — especially the Castilians (Conversi 1997: 15) For example, Cortada wanted to determine why, despite its poor natural environment, Catalonia was so much more successful economically than other parts of Spain. In a series of generalizations, he concluded that the "Catalans have succeeded in developing a strong sense of resolution and constancy over the centuries. Another feature of their character was the fact that they were hardworking people" (Llobera 1983: 342). D’Eixalà and Llorens held a similar understanding of the Catalan national character. They held that two characteristics particular to Catalans were common sense (seny) and industriousness. To them, "the traditional Catalan seny was a manifestation of the Volksgeist", one which made Catalans essentially different from Castilians (Llobera 2004: 75). Nonetheless, this idea lost its importance, and even were abandoned by many sectors (specially from the left-wing Catalanism) during the last years of the 19th century and the first third of the 20th century, thanks to the contact with the ideas of Ernest Renan and its civic and republican concept of nation. Antoni Rovira i Virgili (1882–1949), Catalan nationalist and republican historian and politician, gave support to these ideas. Unlike in the rest of Spain, the Industrial Revolution made some progress in Catalonia, whose pro-industry middle class strove to mechanize everything, from textiles and crafts to wineries. Industrialization and trade went hand in hand with the proto-nationalist Renaixença cultural movement, which, annoyed with the shortcomings of the Royal court in Madrid, began to fashion an alternative, and that was Catalan identity. Furthermore, Barcelona's industrial elite wanted Catalonia to stay part of Spain since Catalonia's industrial markets relied on consumption from other Spanish regions which, little by little, started to join some sort of development. In fact, part of the industrialists’ desire to remain part of Spain was their desire for protectionism, hegemony in domestic markets and the push to "influence Madrid's political choices by intervening in central Spanish affairs" (Conversi 1997: 18–20), thus, it made no economic sense to promote any secession from Spain. On the contrary, Catalonia's prominent industrialists acted as the Spanish leading economic heads. As Stanley Payne observes: "The modern Catalan élite had played a major role in what there was of economic industrialization in the nineteenth century, and had tended to view Catalonia not as the antagonist but to some degree the leader of a freer, more prosperous Spain" (482). Barcelona's bourgeois industrialists even claimed that protectionism and leadership served the interests of the "‘national market’ or of ‘developing the national economy’ (national meaning Spanish here)" (Balcells 19). The inclusion of Spain was instrumental to Catalonia's success, meaning that industrialists would not tolerate any secessionist movement. Claiming that independence would have assured nothing but weak markets, an internal enemy and strengthened anarchist movements. And hence, though manufacturers funded the Renaixença—and Catalan nationalism—they demanded that Catalonia stayed part of Spain to ensure economic stability. This federalist-like lobbying had not worked at first, nor did it succeed until the late 1880s. Finally, in 1889, the pro-industrialist Lliga Regionalista managed to save the particular Catalan Civil Code, after a liberal attempt to homogenize the Spanish legal structures (Conversi 1997: 20). Two years later, they coaxed Madrid into passing protectionist measures, which reinvigorated pro-Spanish attitudes among manufacturers. Then, they also took great profits from Spain's neutrality in World War I, which allowed them to export to both sides, and the Spanish expansion in Morocco, which Catalan industrialists encouraged, since it was to become a fast growing market for them. Also, by the early 20th century, Catalan businessmen had managed to gain control of the most profitable commerce between Spain and its American colonies and ex-colonies, namely Cuba and Puerto Rico. During the first part of the 20th century, the main nationalist party was the conservative Lliga Regionalista, headed by Francesc Cambó. For the nationalists, the main achievement in this period was the Commonwealth of Catalonia, a grouping of the four Catalan provinces with limited administrative power. The Commonwealth developed an important infrastructure (like roads and phones) and promoted the culture (professional education, libraries, regulation of Catalan language, study of sciences) in order to modernize Catalonia. The failure in being granted an Estatute of autonomy in 1919 within the Restoration regime, led to radicalisation of the moderate nationalist parties in Catalonia, leading in turn to the creation of Acció Catalana (Catalan Action) and also Estat Català (Catalan State), drifting apart from the Lliga. Among the leaders of Acció Catalana founded in 1922 and chiefly supportive of liberal-democratic catalanism and a catalanisation process were Jaume Bofill, Antoni Rovira i Virgili and Lluís Nicolau d'Olwer. It also featured an internal elitist faction, moved by the thinking of Charles Maurras and Action française of which Josep Vicenç Foix and Josep Carbonell were representatives, while Jaume Bofill was ambivalent to the extreme right French thinker. Estat Català, somewhat more attached to the idea of downright independence, was founded right after the creation of Acció Catalana by Francesc Macià. The Mancomunitat of Catalonia was dissolved during the dictatorship of Miguel Primo de Rivera in 1925. The anti-Catalan measures taken by dictator Primo de Rivera led to further disappointment among Catalan conservatives, who initially trusted in him because of an earlier support of regionalism prior to his pronunciamiento in September 1923, and also further exacerbation of insurrectionary nationalists. In November 1926 Macià helmed an attempt of military invasion of Catalonia from France which would purposely lead to a civil uprising and the proclamation of the Catalan Republic; he was not able even to get past through the border. In the 2017 Catalonian parliamentary election the nationalist parties that support the creation of an independent state (JuntsxCat, ERC and CUP) obtained a plurality of seats. Catalan President Carles Puigdemont and more than 700 mayors from Catalonia met to show support for holding an independence referendum. In late September 2016, Puigdemont told the parliament that a binding referendum on independence would be held in the second half of September 2017, with or without the consent of the Spanish institutions. Puigdemont announced in June 2017 that the referendum would take place on 1 October, and that the question would be, "Do you want Catalonia to become an independent state in the form of a republic?" The Spanish government said in response, "that referendum will not take place because it is illegal." A law creating an independent republic—in the event that the referendum took place and there was a majority "yes" vote, without requiring a minimum turnout—was approved by the Catalan parliament in a session on 6 September 2017. Opposition parties protested against the bill, calling it "a blow to democracy and a violation of the rights of the opposition", and staged a walkout before the vote was taken. On 7 September, the Catalan parliament passed a "transition law", to provide a legal framework pending the adoption of a new constitution, after similar protests and another walkout by opposition parties. The same day, 7 September, the Spanish Constitutional Court suspended the 6 September law while it considered an appeal from Mariano Rajoy, seeking a declaration that it was in breach of the Spanish constitution, meaning that the referendum could not legally go ahead on 1 October. The law was finally declared void on 17 October and is also illegal according to the Catalan Statutes of Autonomy which require a two third majority in the Catalan parliament for any change to Catalonia's status. The national government seized ballot papers and cell phones, threatened to fine people who manned polling stations up to €300,000, shut down web sites, and demanded that Google remove a voting location finder from the Android app store. Police were sent from the rest of Spain to suppress the vote and close polling locations, but parents scheduled events at schools (where polling places are located) over the weekend and vowed to occupy them to keep them open during the vote. Some election organizers were arrested, including Catalan cabinet officials, while demonstrations by local institutions and street protests grew larger. The referendum took place on 1 October 2017, despite being suspended by the Constitutional Court, and despite the action of Spanish police to prevent voting in some centres. According to the Catalan authorities, 90% of voters supported independence, but turnout was only 43%, and there were reports of irregularities. On 10 October 2017, in the aftermath of the referendum, the President of the Generalitat of Catalonia, Carles Puigdemont, declared the independence of Catalonia but left it suspended. Puigdemont said during his appearance in the Catalan parliament that he assumes, in presenting the results of the referendum, "the people's mandate for Catalonia to become an independent state in the form of a republic", but proposed that in the following weeks the parliament "suspends the effect of the declaration of independence to engage in a dialogue to reach an agreed solution" with the Spanish Government. On 27 October 2017 the Catalan Parliament voted in a secret ballot to approve a resolution declaring independence from Spain by a vote of 70–10 in the absence of the constitutionalist deputies, who refused to participate in a vote considered illegal for violating the decisions of the Constitutional Court of Spain. As a result, article 155 of the Spanish constitution was triggered, the Catalan government was dismissed and direct rule was imposed from the central government in Madrid. Under direct rule from Spain, elections were held in Catalonia on 21 December 2017. The three pro-independence parties retained their control of parliament with a reduced majority of 70 seats and a combined 47.5% of valid votes cast. Ines Arrimadas' anti-independence Ciudadanos party was the most voted party with 25.4% of votes, the first time in Catalan history that a non-nationalist party won most votes and seats in an election. Parties which endorsed the suspension of autonomy by central government represented 43.5% of votes cast and parties which did not include independence in their electoral program amounted to 52.5% of the vote, notably Catcomu-Podem (7.5% of votes and 8 seats), which is opposed to independence but supports a legal referendum and denounced the suspension of autonomy. The excellent performance of the centre-right parties on both sides of the independence debate, Ciudadanos and Juntxcat, and the underperformance of all other parties (notably, left wing parties and the Partido Popular) were the most significant factor in this election result. The 2017 Catalan independence referendum, also known by the numeronym 1-O (for "1 October") in Spanish media, was an independence referendum held on 1 October 2017 in the Spanish autonomous community of Catalonia, passed by the Parliament of Catalonia as the Law on the Referendum on Self-determination of Catalonia and called by the Generalitat de Catalunya. It was declared illegal on 7 September 2017 and suspended by the Constitutional Court of Spain after a request from the Spanish government, who declared it a breach of the Spanish Constitution. Additionally, in early September the High Court of Justice of Catalonia had issued orders to the police to try to prevent it, including the detention of various persons responsible for its preparation. Due to alleged irregularities during the voting process as well as to the use of force by the National Police and Civil Guard, international observers invited by the Generalitat declared that the referendum failed to meet the minimum international standards for elections. The referendum was approved by the Catalan parliament in a session on 6 September 2017 along with the Law of juridical transition and foundation of the Republic of Catalonia the following day 7 of September, which stated that independence would be binding with a simple majority, without requiring a minimum turnout. After being suspended, the law was finally declared void on 17 October, being also illegal according to the Statute of Autonomy of Catalonia which requires a two third majority, 90 seats, in the Catalan parliament for any change to Catalonia's status. The referendum question, which voters answered with "Yes" or "No", was "Do you want Catalonia to become an independent state in the form of a republic?". The "Yes" side won, with 2,044,038 (92.01%) voting for independence and 177,547 (7.99%) voting against, on a turnout of 43.03%. The Catalan government estimated that up to 770,000 votes were not cast due to polling stations being closed off during the police crackdown, although the "universal census" system introduced earlier in the day allowed electors to vote at any given polling station. Catalan government officials have argued that the turnout would have been higher were it not for Spanish and Catalan police suppression of the vote. On the other hand, many voters who did not support Catalan independence did not turn out, as the constitutional political parties asked citizens not to participate in what they considered an illegal referendum. On the day of the referendum, the inaction of part of the autonomous police force of Catalonia, the Mossos d'Esquadra, allowed many polling stations to open. The Spanish National Police Corps and the Guardia Civil intervened and raided several polling stations after they opened. 893 civilians and 111 agents of the National Police and the Guardia Civil were reported to have been injured. According to various sources these previously reported figures may have been exaggerated. According to the judge from Barcelona who is currently investigating the accusations of police violence, there were 218 persons injured on that day in the city of Barcelona alone, 20 of whom were agents. According to the official final report by the Catalan Health Service (CatSalut) of the Generalitat 1066 civilians, 11 agents of the National Police and the Guardia Civil and 1 agent of the regional police, the Mossos d'Esquadra, were injured. The United Nations High Commissioner for Human Rights, Zeid Ra'ad Al, urged the Spanish government to prove all acts of violence that took place to prevent the referendum. The police action also got criticism from Amnesty International and Human Rights Watch which defined it as an "excessive and unnecessary use of force". Spanish Supreme Court judge Pablo Llarena stated Puigdemont ignored the repeated warnings he received about the escalation of violence if the referendum was held. Mossos d'Esquadra are being investigated for disobedience, for allegedly not having complied with the orders of the High Court of Justice of Catalonia to prevent the referendum. Including Josep Lluís Trapero Álvarez, the Mossos d'Esquadra Major, who is being investigated for sedition by the Spanish National Court. Mossos d'Esquadra, deny those accusations and allege they obeyed the orders but applying the principle of proportionality, which is required by Spanish law in all police. ^ "Adiós, España". Retrieved 20 March 2015. ^ "Declaració ideològica d'ERC" (PDF). Archived from the original (PDF) on 2016-03-03. Retrieved 2016-02-09. ^ "Serveis :: Avellana Digital ::". Archived from the original on 16 February 2012. Retrieved 20 March 2015. ^ "PSM-Entesa Electronic Cigarettes –" (PDF). Archived from the original (PDF) on 4 March 2016. Retrieved 20 March 2015. ^ "Notícies". Archived from the original on 12 November 2014. Retrieved 20 March 2015. ^ "PSM-Entesa Electronic Cigarettes –". Archived from the original on 4 March 2016. Retrieved 20 March 2015. ^ "Spain". Encyclopædia Britannica. Archived from the original on 2014-02-15. Retrieved 20 March 2015. ^ Granja Sainz 2000, p. 154. ^ a b Gabriel 2000, p. 86. ^ Payne 1999, p. 21. ^ González Cuevas 2009, pp. 213–214. ^ Sueiro Seoane 1992, p. 385. ^ Sueiro Seoane 1992, p. 385-386. ^ Gonzàlez i Vilalta 2011, pp. 49; 61. ^ "Encuesta sobre la independencia: un 15% de votantes del PP catalan son secesionistas – Burbuja.info – Foro de economía". Retrieved 20 March 2015. ^ "Wayback Machine" (PDF). 27 February 2008. Archived from the original (PDF) on 27 February 2008. ^ Berwick, Angus; Cobos, Tomás (28 September 2016). "Catalonia to hold independence referendum with or without Spain's consent". Reuters. Archived from the original on 11 October 2016. Retrieved 10 October 2016. ^ a b "Tensions grow in Spain as Catalonia independence referendum confirmed". Telegraph. 9 June 2017. Archived from the original on 10 June 2017. Retrieved 17 June 2017. ^ a b "Catalonia to hold independence vote despite anger in Madrid". The Guardian. 6 September 2017. Retrieved 20 October 2017. The Catalan government has not set a threshold for minimum turnout, arguing the vote will be binding regardless of the level of participation. ^ Jones, Sam (10 September 2017). "Catalans to celebrate their national day with independence protests". Theguardian.com. Retrieved 18 September 2017. ^ "Catalonia's parliament approves law aimed at independence from Spain". EFE. 7 September 2017. Retrieved 14 October 2017. ^ Spongenberg, Helena (7 September 2017). "Catalan authorities call independence vote". EUobserver. Retrieved 23 October 2017. ^ "Catalan Parliament passes transition law". Catalan News. 8 September 2017. Retrieved 23 October 2017. ^ "Catalan Parliament Passes Bill to Secede from Spain at 1 a.m., after Second Marathon Day in Chamber". The Spain Report. 8 September 2017. Archived from the original on 2017-10-23. Retrieved 23 October 2017. ^ "Spain's constitutional court suspends Catalan referendum law: court source". Reuters. 7 September 2017. Retrieved 14 October 2017. ^ "Spain Catalonia: Court blocks independence referendum". BBC News. 8 September 2017. Retrieved 7 October 2017. ^ "Spain just declared Catalan referendum law void". The Independent. 17 October 2017. ^ "Catalonia plans an independence vote whether Spain lets it or not". The Economist. ^ "Catalan independence referendum". The Daily Star. 10 October 2017. ^ Ríos, Pere (6 September 2017). "Las diez claves de la ley del referéndum de Cataluña". El País. Retrieved 30 September 2017. ^ Burgen, Stephen (30 September 2017). "Catalonia riven with tension as referendum day arrives". Guardian. Retrieved 22 October 2017. ^ a b "Catalonia independence declaration signed and suspended". BBC News. 10 October 2017. Retrieved 13 October 2017. ^ "El president catalán Carles Puigdemont declara la independencia en el Parlament, pero la deja en suspenso (The Catalan President Carles Puigdemont declares the independence in the Parliament, but leaves it suspended)" (in Spanish). El País. 10 October 2017. Retrieved 10 October 2017. ^ "Elecciones catalanas". El País (in Spanish). 22 December 2017. Retrieved 22 December 2017. ^ Giles, Ciaran; Parra, Aritz (17 October 2017). "Spain: Top court officially rules Catalan referendum illegal". Chicago Tribune. Retrieved 20 October 2017. ^ "El gobierno de Cataluña convocó para el 1 de octubre el referéndum de autodeterminación". Infobae (in Spanish). 6 September 2017. Retrieved 20 October 2017. ^ Jones, Sam (6 September 2017). "Catalonia to hold independence vote despite anger in Madrid". The Guardian. Retrieved 16 October 2017. ^ "Why the referendum on Catalan independence is illegal". The Economist. 26 September 2017. ^ "How to Stage an Illegal Referendum". Bloomberg.com. 20 September 2017. ^ Alandete, David (10 October 2017). "Independence in Catalonia – now what?". El País. ^ "Spain Catalonia: Court blocks independence referendum". BBC News. 8 September 2017. Retrieved 18 October 2017. ^ "Recurso de inconstitucionalidad n.º 4334-2017, contra la Ley del Parlamento de Cataluña 19/2017, de 6 de septiembre, del Referéndum de Autodeterminación" (PDF) (in Spanish). Agencia Estatal Boletín Oficial del Estado. 6 September 2017. Retrieved 5 October 2017. ^ Duarte, Esteban (11 September 2017). "Catalan Separatists Plot Show of Force in Battle With Madrid". Bloomberg. Retrieved 13 September 2017. ^ Carranco, Rebeca; García, Jesús (21 September 2017). "La justicia desmonta la organización del referéndum ilegal de Cataluña". El País (in Spanish). ^ "Una juez ordena a Google eliminar la aplicación sobre el referéndum catalán" (in Spanish). Reuters. ^ "Catalonia's Superior Court also orders Catalan Police to close off planned polling stations". El Nacional. ^ "Did the referendum comply with basic voting regulations?". El País. 3 October 2017. ^ Gallego-Díaz, Soledad (5 October 2017). "Mediaciones e instituciones". Hoy por hoy (in Spanish). Cadena SER. ^ Ríos, Pere (6 September 2017). "Las diez claves de la ley del referéndum de Cataluña". Retrieved 30 September 2017. ^ "Catalan referendum results". Government of Catalonia. 2 October 2017. Archived from the original on 6 October 2017. Retrieved 3 October 2017. ^ "El Govern anuncia un 90% de 'síes' entre las 2.262.424 papeletas contadas y asegura haber escrutado el 100,88% de votos" (in Spanish). El Mundo. 2 October 2017. Retrieved 3 October 2017. ^ Hilary Clarke; Isa Soares; Vasco Cotovio (2 October 2017). "Catalonia referendum plunges Spain into political crisis". CNN. Retrieved 4 October 2017. ^ "El independentismo, en númerus clausus" (in Spanish). El Periódico de Catalunya. 3 October 2017. Retrieved 4 October 2017. ^ "El 'sí' obtuvo más votos que personas censadas en 71 municipios" (in Spanish). El País. 3 October 2017. ^ Hilary Clarke, Isa Soares and Vasco Cotovio (2 October 2017). "Catalonia referendum plunges Spain into political crisis". CNN. Retrieved 4 October 2017. Turnout was about 42% of the 5.3 million eligible voters... Turull said more people would have voted had it not been for Spanish police suppression. Up to 770,000 votes were lost as a result of the crackdowns at police stations, the Catalan government estimated. ^ Gerard Pruina (2 October 2017). "El 'sí' a la independència s'imposa amb 2.020.144 vots, el 90%". Ara.Cat. Retrieved 4 October 2017. Els encarregats de donar els resultats des del Centre Internacional de Premsa, el vicepresident, Oriol Junqueras; el conseller de la Presidència, Jordi Turull, i el conseller d'Exteriors, Raül Romeva, han remarcat contínuament que, tot i que els 2.248.000 vots no suposen 'per se' el 50% del cens, els càlculs dels experts apunten que sense pressió policial i tancament de col·legis s'hauria pogut arribar al 55% de participació. ^ "Los Mossos cerraron más colegios el 1-O". La Vanguardia. 6 October 2017. Retrieved 13 February 2019. ^ Erickson, Amanda (30 September 2017). "Catalonia independence vote: What you need to know". Washington Post. Retrieved 2 October 2017. ^ "Iceta pide a los catalanes que no acudan a votar para no "dar valor" al referéndum". ABC (in Spanish). ^ Molpeceres, Diego. "Referéndum en Cataluña - Un referéndum sin campaña por el 'no' a la independencia". Vozpópuli (in Spanish). ^ "1-O.La pasividad de los Mossos y las posteriores cargas policiales marcan un día de tensión con votaciones sin garantías" (in Spanish). Eldiario.es. 1 October 2017. Retrieved 3 October 2017. ^ a b "Policías y guardias realizan cargas ante la pasividad de los Mossos y dejan más de 893 heridos el 1-O" (in Spanish). El Mundo. 2 October 2017. Retrieved 3 October 2017. ^ Giles , Aritz Parra and Ciaran (2 October 2017). "Catalonia urges mediation with Spain in secession dispute". AP – via www.washingtonpost.com. ^ Serra, Ot (20 April 2018). "El govern espanyol va quadruplicar la xifra d'agents ferits l'1-O". Ara (in Catalan). Retrieved 26 April 2018. ^ "Report on the incidents that took place from the 1st to the 4th of October 2017" (PDF). Catalan Health Service, Generalitat de Catalunya. 20 October 2017. ^ "UN human rights chief urges probe into violence during referendum in Catalonia". United Nations. UN News Center. 2 October 2017. Retrieved 3 October 2017. ^ "The Latest: UN chief hopes sides will solve Catalan crisis". CNBC. 2 October 2017. ^ "Spain: Excessive use of force by National Police and Civil Guard in Catalonia". Amnesty International. 3 October 2017. Retrieved 10 October 2017. ^ "Spain: Police Used Excessive Force in Catalonia". Human Rights Watch. 12 October 2017. Retrieved 16 June 2018. ^ "La euroorden señala que Puigdemont obvió los avisos de que el 1-O provocaría una escalada de violencia". ABC. 30 March 2018. ^ "El juez Llarena recalca en la orden de detención que Puigdemont ignoró los avisos de escalada de violencia". El Mundo. 30 March 2018. ^ "Siete jueces investigan a los Mossos por desobediencia al no frenar el 1-O" (in Spanish). El Periódico de Catalunya. 2 October 2017. Retrieved 3 October 2017. ^ "Spanish judge calls on Catalan police chief to testify in sedition probe". EFE. 4 October 2017. Retrieved 4 October 2017. Conversi, Daniele. "Language or race? : the choice of core values in the development of Catalan and Basque nationalisms." Ethnic and Racial Studies 13 (1990): 50–70. ---. "Rural Traditionalism and Conservative Nationalism in Catalonia 1865–1900." Critique of Anthropology X (1990): 51–72. González Cuevas, Pedro Carlos (2009). "Charles Maurras et l'Espagne". In Olivier Dard; Michel Grunewald (eds.). Charles Maurras et l'étranger, l'étranger et Charles Maurras: l'Action française (in French). Bern: Peter Lang. pp. 193–264. ISBN 978-3-0343-0039-1. ISSN 1421-2854. Linz, Juan. "Early State-Building and Late Peripheral Nationalisms Against the State: the Case of Spain." Building States and Nations: Analyses by Region. Eds. S.N. Eisenstadt, and Stein Rokkan. Beverly Hills: Sage, 1973. 32–116. ---. "The idea of Volksgeist in the formation of Catalan nationalist ideology" Ethnic and Racial Studies 6 (1983): 332–350. Payne, Stanley G. "Nationalism, Regionalism and Micronationalism in Spain." Journal of Contemporary History 26.3/4 (1991): 479–491. Smith, Angel, and Clare Mar-Molinero. "The Myths and Realities of Nation-Building in the Iberian Peninsula." Nationalism and the Nation in the Iberian Peninsula: Competing and Conflicting Identities. Eds. Angel Smith, and Clare Mar-Molinero. Washington, D.C.: Berg, 1996. 1–33. Smith-Peter, Susan. "The Six Waves of Russian Regionalism in European Context, 1830–2000." In Russia's Regional Identities: The Power of the Provinces. Ed. Edith W. Clowes, Gisela Erbsloh and Ani Kokobobo. New York: Routledge, 2018, 15–43. ---. "Spain and Catalonia." Review III (1980): 527–577.